Is this what you’ve all been waiting for? The foodie post? 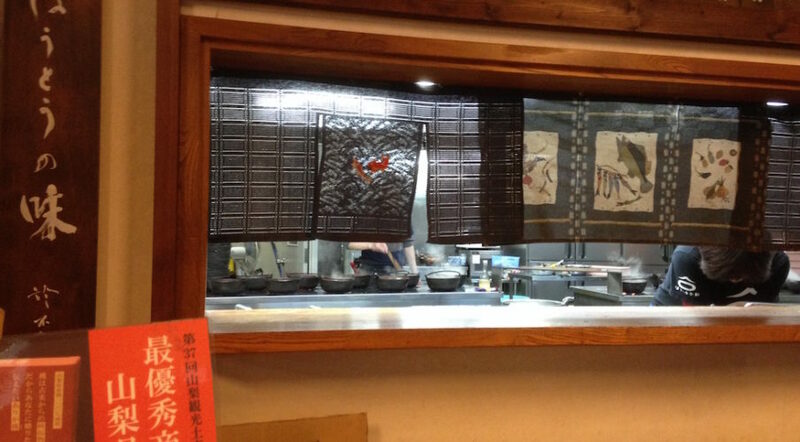 Well, I’ve gone over the Hiroshima okonomiyaki, yummy tacoyaki among other things at Nishiki Market, and the kaiseki in Kyoto at Gion Nanba, so I’m going to post some pictures here and talk about some of the other nice meals we had. We also had omurice, tempura, ramen, and pizza/pasta but I don’t have pictures or specific memories of those so won’t bore you with nothingness. So back to Kyoto, between instant noodle and/or toast breakfasts, bento boxes from department store food courts, we managed to squeeze in a visit to the famous Coco Curry. We didn’t quite understand how to order but managed to get ourselves a curry each (including one for Oscar), everyone got a mild curry so it was basically gravy, but it was still yummy, this was probably Oscar’s favourite meal of the whole trip as he ate all of his serve and then some. I ordered a set meal but this didn’t specify the spice level, while everyone else ordered from the combination menu which allows you to choose a base curry, and select the spice level, and then extras and add-ons to spice up the meal (pun totally intended). And yet they still just went with mild curry, but anyway, it was definitely an easy meal. The only other picture of a meal I have is from our old favourite udon restaurant in the Porta Shopping mall, just outside Kyoto Station. We had quite a good recollection of eating udon here the last time we were in Kyoto, the memory was so good that we just had to come back. In reality though, we remembered that there was a pretty good udon place in the Porta shopping mall and didn’t want to run any risks as we were kind of in a rush and needed something that Oscar would likely eat. That’s not to say that the udon here isn’t good, it’s plenty good and very possible that in a similar situation next time we are in Kyoto we may visit again. 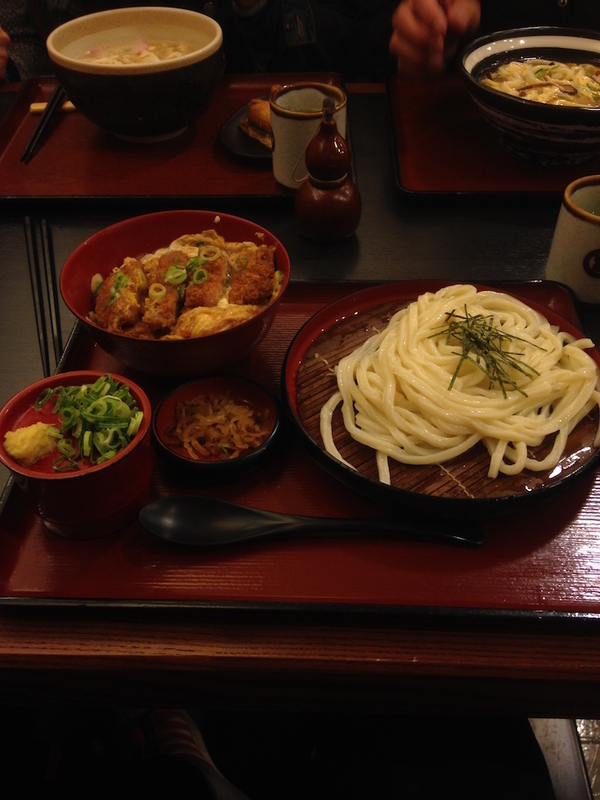 I had the cold noodles this time with a chicken katsu set, the noodles are so thick and chewy here, I like it. 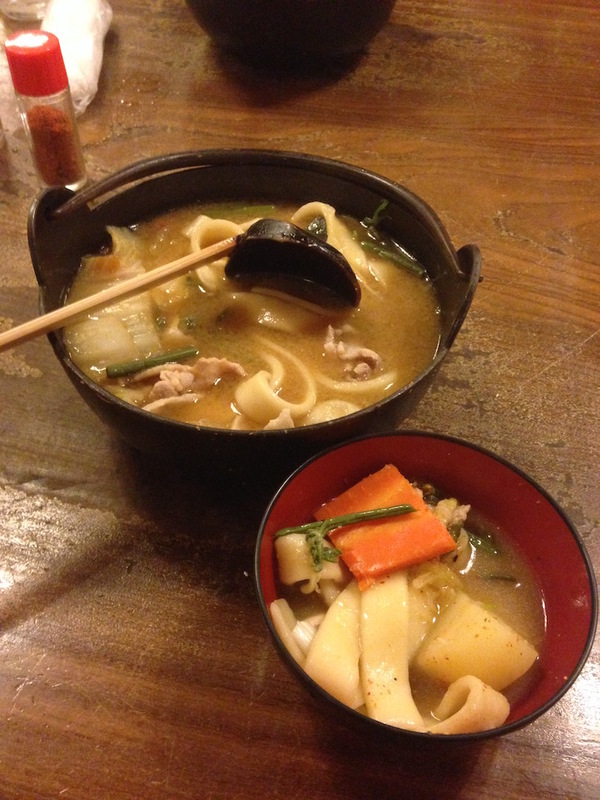 Even in a relatively small town (or perhaps especially because) like Kawaguchi-ko there are specialties to try. The specialty of the area (Yamanashi) is hoto, which is a type of noodle similar to udon, but the noodles are flatter and wider, the broth is usually filled with seasonal vegies and root vegies (especially pumpkin) and pork based. So we were strolling around on that cloudy day in Kawaguchi-ko looking for something to eat when we stumbled upon this hoto restaurant just near the train station. We definitely remembered how yummy hoto was, so we stepped right on in and tried this one out (it’s only open from 11am-7pm). 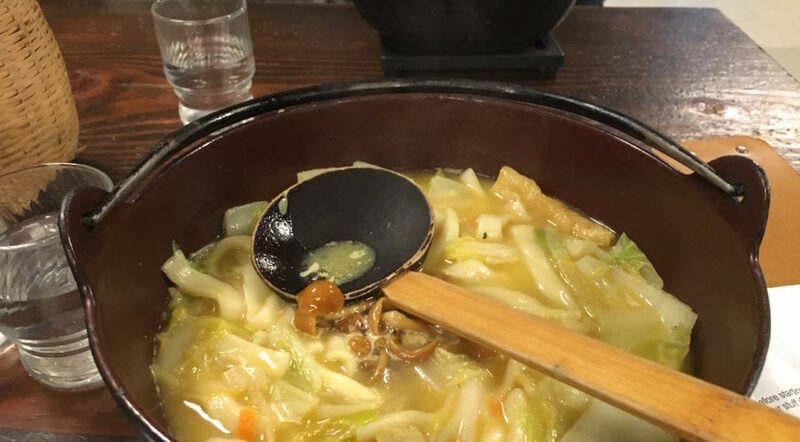 Compared to Hoto Kosaku, the actual bowls are a bit bigger (with the amount of food being about the same), there are not as many broth or add-on options here, but it still hits the spot if you’re after pork or vegie based noodle soup. The price for two bowls was about 25$ AUD (or a bit over 2,000¥), I would expect that we would drop by again next time we’re in Kawaguchi-ko :D.
This is the hoto restaurant that the hostel always recommends, and with good reason, the hoto here is bloody good and there are many options for broth (whatever you can think of really) as well as extras. We’re always a little price conscious so we didn’t splurge on the higher priced dishes (can’t remember off the top of my head but maybe something like crab or goose, something kind of exotic), I just got the stock standard pork hoto, and Emmy splurged on the seafood hoto. This place is super busy but the queue moves quite quickly, you basically walk in and have to put your name down to reserve your spot. Once you’ve got your table though, you should quickly work out what you want and flag a waiter/waitress down to make your order as they’re super busy and not looking for customers with empty tables. Some tables on the sides have pits where you can dangle your feet but both times we’ve been there we have not had the fortune of such a luxury and had to sit cross legged on the floor. 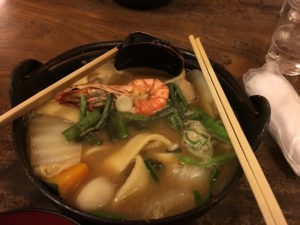 The noodles here are super luxurious, they’re probably wider and flatter than the ones at Hoto Fudo, the broth very sweet and tasty, this is a can’t miss in Kawaguchi-ko. These two bowls cost us about 40$ AUD (or 3,500¥) so a fair bit more pricey than Hoto Fudo for a similar quantity, it’s your own choice whether the extra options are worth your hard earned. 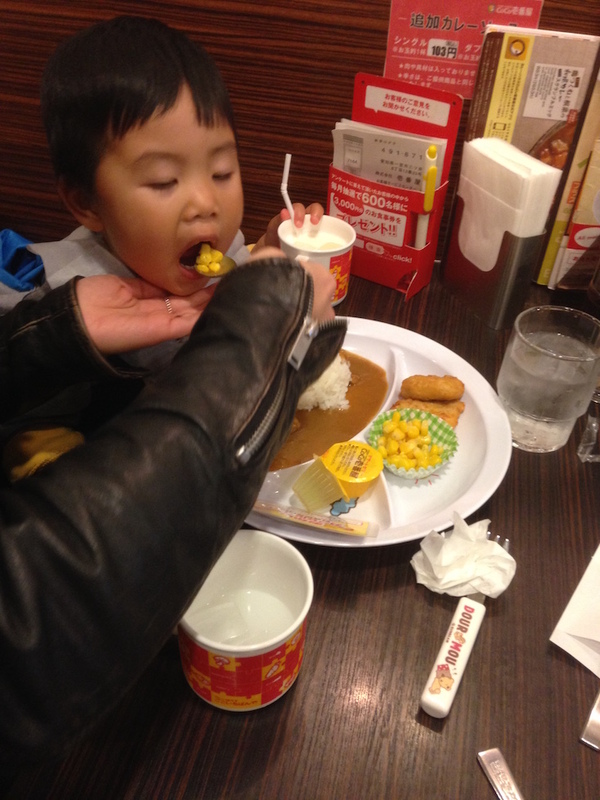 We mostly ate in the shopping mall food courts in Tokyo, but there are plenty of tasty options to be had there as well, although a bit pricier than some of the places you can find elsewhere. One such place that was actually memorable was this place on the eighth floor (if I remember correctly) of the Lumine Est shopping mall (how many times have we been here?). We were kind of stuck for a place to eat and decided to just pick a place on this floor, there were a couple of good options but in the end we were won over by the plastic food of this place. 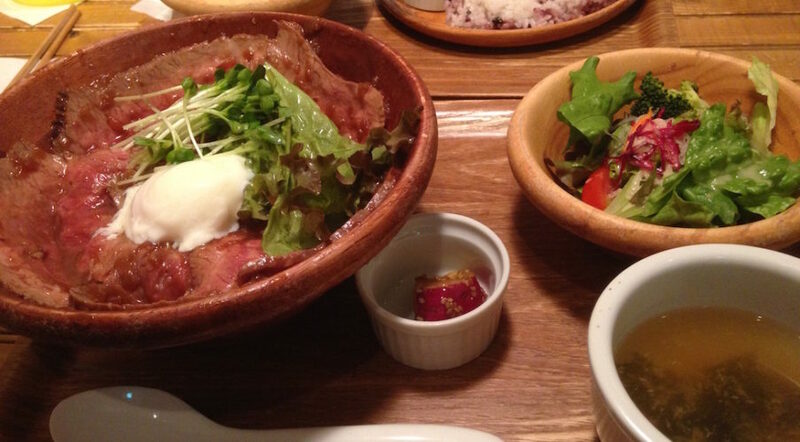 I had the roast beef on rice (with a poached egg) and side of sald, while Emmy had some kind of deep fried chicken. The beef was pretty tender, but the slices were pretty big and a bit chewy so it wasn’t the easiest thing to eat (no knife either), but it was quite tasty. Meanwhile, we ordered some dessert for the age-old reason YOLO! 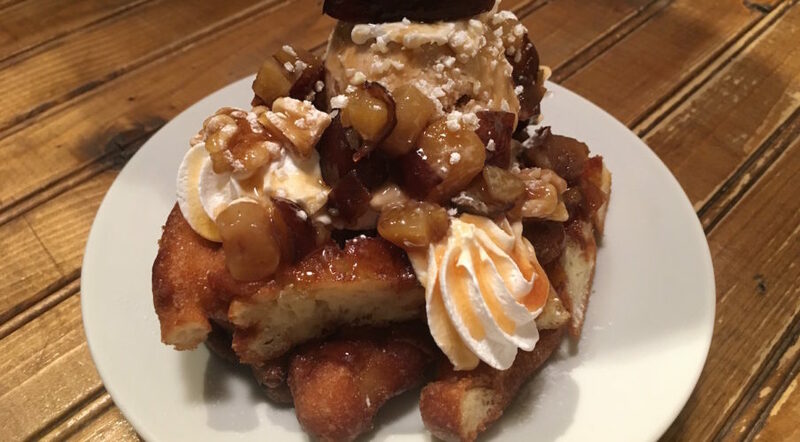 I’m never going to argue against waffles, and especially not when they are covered with other delicious walnuts, cream, caramel?, and iced cream. This was only the half dessert option, there’s no way we could have done the whole cake, although I’m sure Oscar would have tried his best. The highlight of the Tokyo eating time was definitely this place, one which comes with the advantage of knowing a local, as this was a recommendation from Emmy’s friend’s husband. 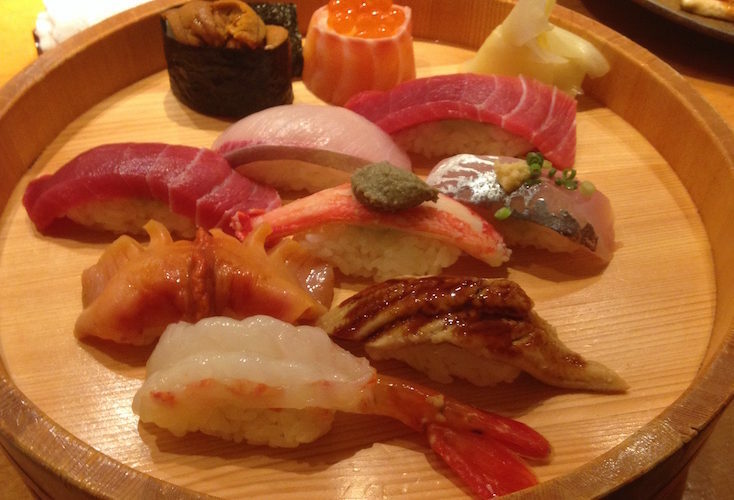 We went looking on a Tuesday night for some izakaya, but his preferred haunts were all full up so we had to settle for a sushi restaurant. 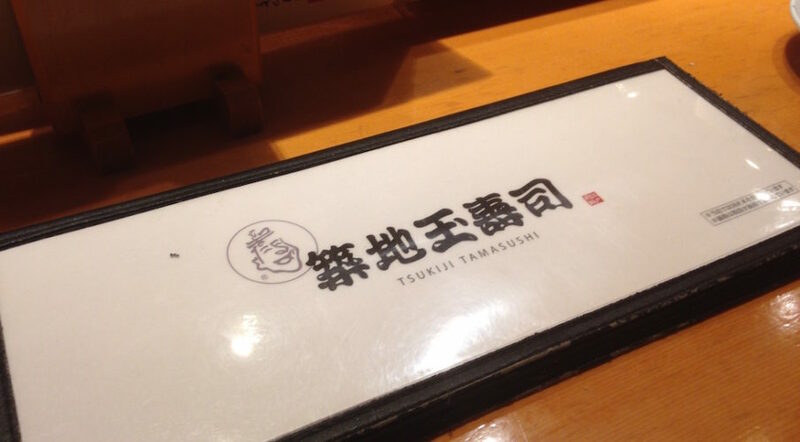 Judging by the name this place is in Tsukiji (we were in the Ginza/Tsukiji area), it was definitely worth the money we forked out. 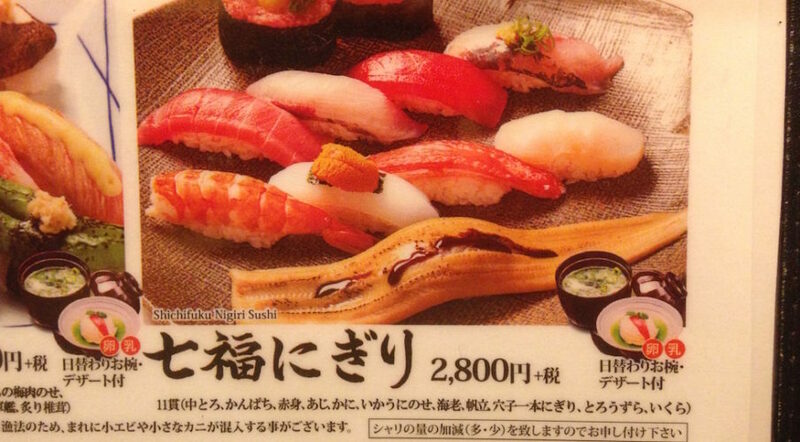 As you can probably tell from the menu pictures, the food pretty much matches the picture (maybe with a variation or two possibly due to seasonality), but the big thing to note is the price. 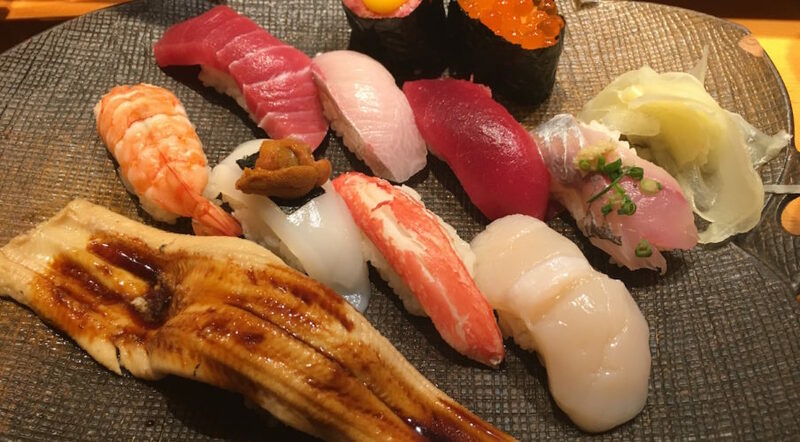 Mine is a ten course omakase for 3,100¥ (approximately 40$ AUD), for the same thing here (albeit perhaps served with a bit more pomp) you’d expect to pay upwards of 90$. 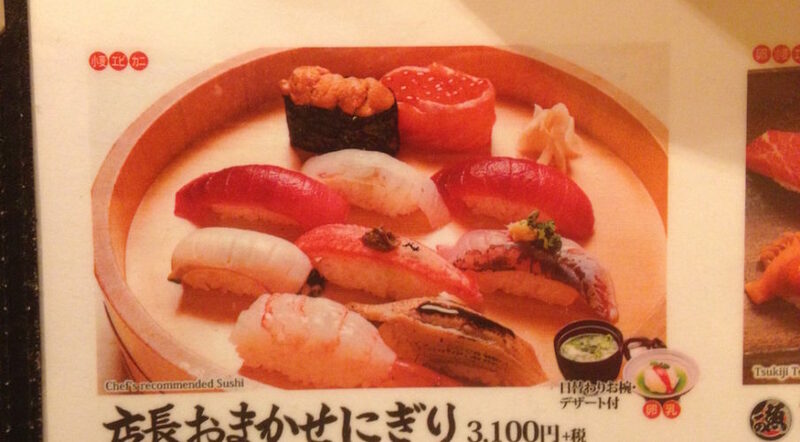 So what if it was all served at once on one dish for me, it’s fresh and well made and only 40$. That eel (the big one) on Emmy’s dish had a really tasty sauce on it too. 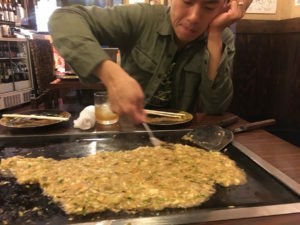 Finally, we have an unknown okonomiyaki restaurant in Yoyogi, this place was near our accommodation which made it easy enough. 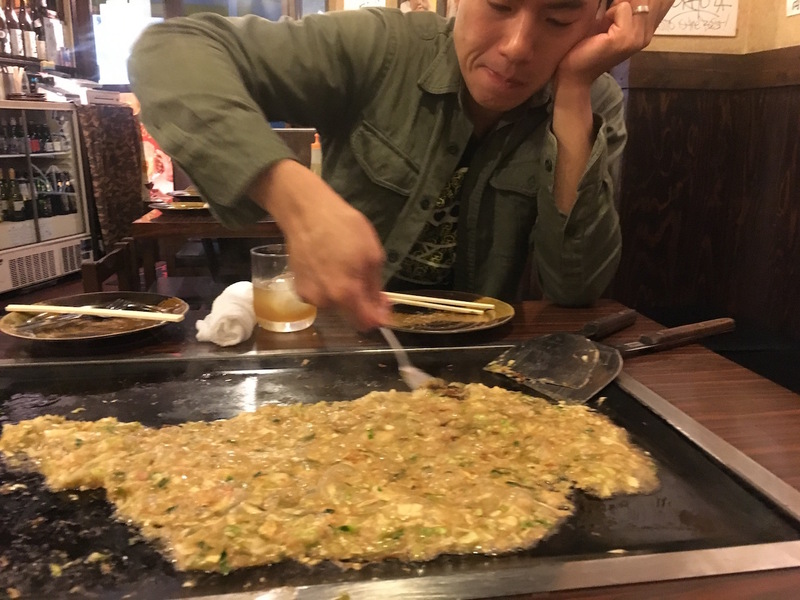 Emmy wanted to try out this dish, monjayaki, which is sort of similar to okonomiyaki but has different ingredients, but still fried on a flat grill. As you can see from the picture it pretty much looks like vomit, but I can assure you it tastes a hell of a lot better. I’m not really sure what’s in there, cabbage, probably egg to bind, I think this was a mountain type or something so it had ingredients that you find on the mountains. We also had a couple of okonomiyakis after this because they weren’t too filling. This was a very Japanese restaurant as there were only locals eating there and the staff (all women interestingly) didn’t speak any English. They did work out that we needed an English menu and that we probably needed them to cook for us though (unlike the locals who grilled for themselves), I think we can probably do it for ourselves next time if we do visit another such establishment. There isn’t that much to it really, just stir it a bit to mix it up real good then pour it on to the pan and flatten it out, let it cook until ready. I actually got to do the flip on one of the okonomiyakis, and it was spectacular! That’s it, it’s only taken three weeks to complete my holiday rundown, that must be a record. I may add some more picture posts as I go through my photos more thoroughly, but for the most part, I’m done, until next time, and there will be a next time.